I can't think of anything that gets me in the mood more for Christmas than Ice Skating. There's something about twirling around, beneath a huge Christmas tree, to the sound of classic festive tunes, that makes me smile and feel cheerful. 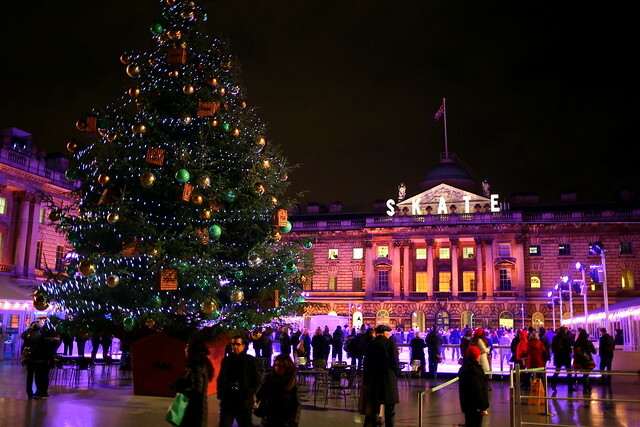 I've been to many of the different ice rinks, but my favorite my a mile is Skate at Somerset House. 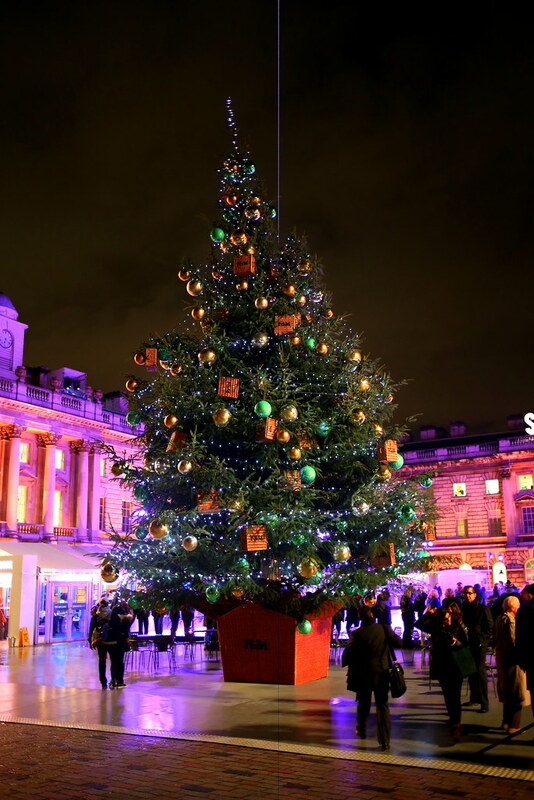 Paired with Fortnum and Mason, the iconic Somerset House, the huge tree in the courtyard; it makes for a very pretty skate. Now whilst I love ice skating, I am actually truly horrific at it, and so my camera was not coming anywhere near the ice, so there are no shots of my on my bum on the ice. However here are some more graceful skaters. After whizzing (stumbling) around for an hour, it was time to head inside for some winter, ski themed food from Fortnum and Mason, in their pop up restaurant called The Lodge. 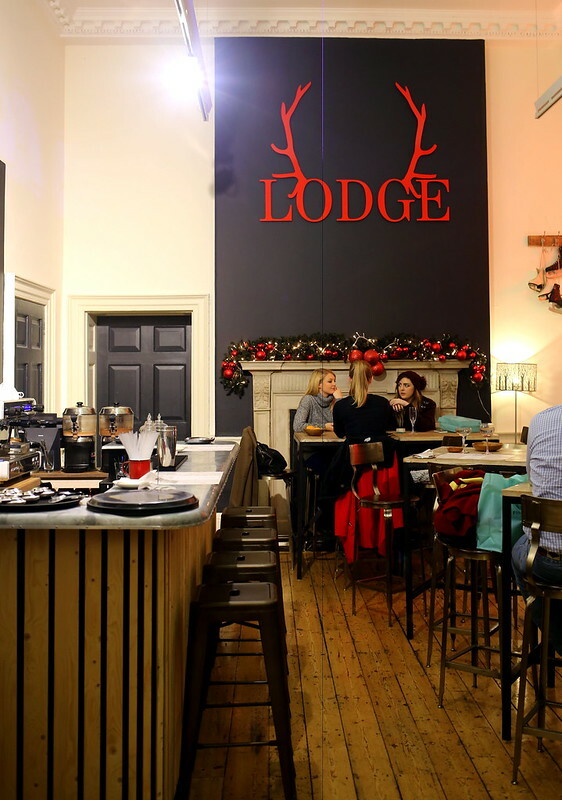 The Lodge is cute and cosy, with that ski chalet feel, with a few Fortnum luxuries thrown in. For starters I opted for Smoked Salmon, Crème Fraîche and Baerii Caviar topped belinis, which were delicious and light. However, we all know alpine food is not meant to be light. Having never been skiing before (although that has now changed- so stay tuned for upcoming posts) I had never experienced the joy that is the Reblochon Tartiflette. Without sounding too over the top, but a tartiflette is just my idea of heaven. If you don't know what it is, it's like dauphinoise potatoes, with bacon or ham in it, baked into some kind of delicious cheesy dish. 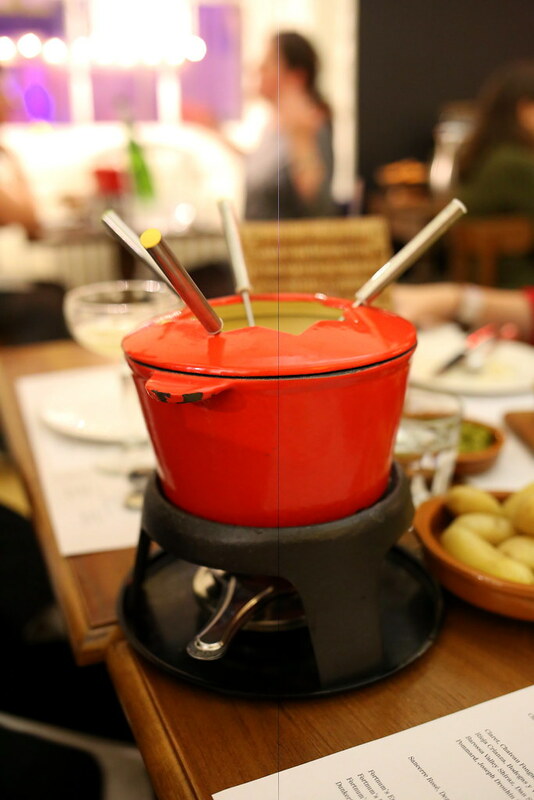 However one to miss is the fondue sadly. I was really excited for fondue, but it just wasn't that nice. The cheese has this strange tang- just give it a miss. It's nice over the festive period, as it draws people out and you often run into old friends, including Catherine. Helen- well she's a regular! But one thing you have to get- even if you don't want food- is one of their CHOCOLOSSUS. It is Fortnum's secret hot chocolate recipe that has been used for 100's of years. First you pick your chocolate- milk or dark- then a flavoured marshmallow, and then you make it merry. You pick your booze. I opted for coffee liquor, but if you are feeling brave, you could go for tequila. Seriously, this hot chocolate is up their with the best of the bunch. It's a real winner. After the hot chocolate and ice skating, I was feeling truly in the festive spirit. I do hate how Christmas starts so early now as it looses the appeal by the time it gets to December, however it is little gems like this that regains my festive spirit. Skate is on until the 10th January, so go have some fun with friends and family. Tickets can be bought here online. Also let me know what you think of my new blog re-design. This entire place looks like such a winter wonderland. I am horrible at skating so might have to pop along and enjoy the Après-skate and fondue in The Lodge instead. Ahh love your photos, it was so lovely to bump into you and Helen there! I'm still trying to persuade Dan to start his 'FFF' blog haha! Great place to skate here.